Spanning nine time zones and two continents, Russia is the world’s largest country and a land of limitless adventure. RIR picked out ten of the best escapades between the Gulf of Finland and the Bering Straight. Siberia’s Lake Baikal is the world’s largest, deepest, and oldest lake. Baikal is a fine place to sit on the beach in summer, but true adventurers visit during winter. In 2010, an American-Venezuelan team completed the first winter circumnavigation around Baikal on bicycles, riding around the lake in 36 days. 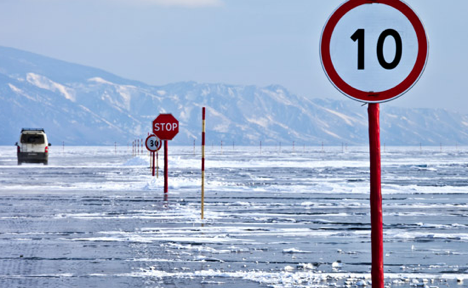 Strong winds keep Baikal free of snow, creating ideal conditions for winter cycling on bikes with studded snow tires. Irkutsk-based Baikal Adventure leads four-day winter bike trips up Baikal’s western coast, stopping to camp along the way. Cyclists can also rent a bicycle from Jack Sheremetoff, owner of the Baikaler hostel in Irkutsk. Jack embarks on a winter cycling tour on Baikal each March and invites travelers to join for free providing they bring their own equipment. Email: info@baikaler.com for more. Sandwiched on the borders with Mongolia, China, and Kazakhstan, the Altai Republic is a region where snowcapped peaks give way to canyons, deep river valleys, and pristine blue lakes. The Altai Republic is an excellent place to trek in the summer and a convenient side trip if you’re taking the Trans-Siberian Railroad across Russia. The region around Mt. Belukha (4,506 metres), Siberia’s highest mountain, is famous for its remote waterfalls and glaciers. Mt. Belukha is surrounded by serious wilderness and trails are poorly marked, so its advisable to trek with a guide. ASTRAVEL Ecotours offers a 12-day tour ($1,700) up Mt. Belukha and through the surrounding countryside. Moscow and St. Petersburg might feel cold, but they’ve got nothing on Franz Josef Land, a distant Russian archipelago in the Arctic Ocean. Franz Josef Land was once the embarkation point for North Pole explorers and where many of those brave souls met their end. Today, it’s a stopover point for Russian ships traveling to the North Pole. Most ships bound for the North Pole leave from Murmansk, the world’s largest Arctic city and one of the best places in Russia to view the northern lights. Quark Expeditions leads a 14-day tour ($25,000) on an icebreaker from Murmansk to the North Pole. Along the way, you’ll see polar bears and Arctic birds, hike on Franz Josef Land, and ride a hot air balloon above the North Pole. Tours must be booked well in advance. The Yamal Peninsula juts into the Arctic Ocean where the Ob River meets the sea. Each summer, the native Nenet people, who survive as nomadic reindeer herders, travel with groups of up to 10,000 reindeer to grazing grounds in the Yamal Peninsula’s north. During their migration, Nenets live in chums, funnel-shaped tents of reindeer hide that resemble the teepees of North American Indians. Briton turned Muscovite, Edward Adrian-Vallance, leads tours to the Yamal Peninsula and has long-standing relationships with the Nenets. Edward brings visitors to live with a Nenet family and observe them moving their camp and reindeer. Tours average $5,000 and include travel to the Yamal Peninsula by train from Moscow. Visit www.yamalpeninsulatravel.com for more information. In 2008, Mckenzie Funk hitchhiked across Russia, from Vladivostok to Moscow, to write an article for National Geographic . Hitchhiking, known as ‘avtostop’ in Russian, might get a bad rap, but its one of the best ways to see a country. Instead of watching the scenery float past through a train window, hitchhiking allows travelers to meet locals who can teach you far more about a place than you might learn on a tour. If you’re thinking of hitchhiking, bring a good roadmap and use your judgement. Remember, if a driver pulls over and you get a bad feeling, you don’t have to get in. A number of hitchhiking clubs in Russia hold educational meetings about thumbing rides. The Academy of Free Travel club in Moscow has sponsored hitchhiking trips across Russia, Africa, and the Middle East. In 1902, Russian explorer, Vladimir Arsenyev, mapped the region north of Vladivistok in Russia’s Far East with Dersu Uzala, a Native trapper. During his ramblings, Arsenyev frequently saw Siberian tigers and wrote about them in his memoirs. Today, Just 350-400 Siberian tigers remain in the wild, mainly in the mountains where Arsenyev once trod. The Wildlife Conservation Society has championed anti-poaching campaigns and the tigers are showing signs of recovery. Arsenyev’s days of traipsing through forests filled with tigers are gone, but www.responsibletravel.com organizes a two week Tiger Safari ($4,000) where travelers hike in the taiga with local guides and search for wild tigers. The tour also provides the chance to see bears, deer, or even an Amur leopard, the world’s most endangered cat. Southern Russia’s Mt. Elbrus (5,642 metres) is Europe’s highest mountain and a natural destination for climbers attempting to conquer the world’s highest peaks. Elbrus was first climbed in the 19th century by separate expeditions led by British and Russian teams. Olympic torch bearers recently carried the symbolic flame up Elbrus in anticipation of the 2014 Winter Olympics in nearby Sochi. It’s recommended to spend several days adjusting to the altitude before climbing Elbrus. LenAlpTours offers a nine-day tour ($1,000) with acclimatizing ascents up nearby peaks that culminates with an Elbrus climb. Non-hikers can still enjoy the views from Elbrus: a gondola and chairlift carry visitors up to 3,800 metres and you won’t even break a sweat. Kamchatka is a rugged peninsula flanked by the Pacific Ocean and the Sea of Okhotsk and centred by a spine of smoking volcanoes. Located in the Ring of Fire, a rough circle of active volcanoes in the Pacific, Kamchatka is easily one of Russia’s most enthralling adventure destinations. In recent years heli-skiing—skiing down mountains only accessible by helicopter—has become popular in Kamchatka. Most heli-skiing operations in Kamchatka drop skiers on volcanoes from where you can ski down fresh powder to the Pacific. Vertikalny Mir offers an eight-night heli-skiing package that includes accommodation ($700 per person in a group of 12). The Yenisey is one of Siberia’s great rivers and the world’s fifth longest. In 2001, Australian adventurer, Tim Cope, and three other men repaired the rotting hull of an abandoned boat on Lake Baikal and rowed it down the Yenisey. The team took shifts, rowing 24 hours each day, until they reached the Yenisey’s mouth in the Arctic Ocean. Those hoping to recreate Cope’s Yenisey trip should read Rivers of an Unknown Land , an English-language guide by rafter, Vladimir Gavrilov, about boating in the former Soviet Union. You can also travel the Yenisey in a comfortable passenger boat. Ships embark on a 10-day, 4,000 kilometer round-trip journey on the Yenisey between the city of Krasnoyarsk and the remote port of Dudinka in the Arctic from June to October. Contact SibTourGuide in Krasnoyarsk to arrange a Yenisey tour. Traversing the M-56 Federal Highway in Russia’s Far East is one of the world’s last great adventures. Known as the Road of Bones for the thousands of gulag prisoners who died during its construction, this dirt road begins in Yakutsk, one of the world’s coldest cities, and extends through 2,000 kilometers of taiga forest and permafrost to the city of Magadan on the Pacific. British actors, Ewan McGregor and Charley Boorman, attempted to cross the M-56 on their 2004 round the world motorcycle expedition , but rushing rivers with no bridges ended their journey. Truckers make the trip in winter when the permafrost solidifies and the rivers freeze. DVS-Tour in Magadan can organize a trip on the Road of Bones or help round-the-world adventurers ship their cars or motorcycles onward to North America. In Yakutsk, Nord Stream also runs a trip on the M-56 ($3,500-4,000, 6-8 days).